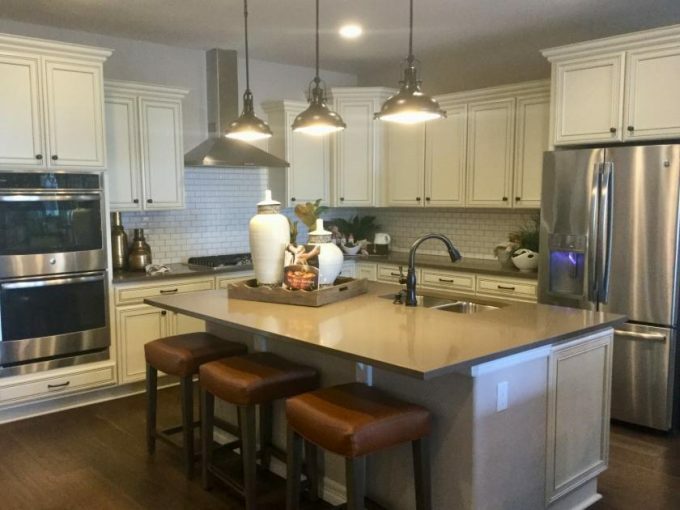 Looking for a new built home in Centennial, Colorado? There are not a lot of new home communities within Centennial. Certainly not as many choices as neighboring Aurora. However, you do have some options within Centennial. The largest new built home community in the city of Centennial is the Copperleaf community. Copperleaf is located in the far eastern reaches of Centennial, just off E470 and Quincy. Richmond American Homes is currently building two collections within Copperleaf in Centennial. Today we’ll take a look at their home collection which is being built in the Ponderosa and Maple sections of Copperleaf. In this collection Richmond is offering homebuyers the choice of eight floor plans, including two ranch homes. Two models are onsite to tour. Be sure to watch the videos below for full walking tours of these models! Copperleaf is a tree themed master planned community. It was designed with ample open space, trails and parks. Residents can also enjoy the community clubhouse and pool. Copperleaf is located within the highly rated Cherry Creek School District and all schools are very close. For more information or to see these homes in person contact Courtney Murphy. Courtney is a Denver metro Realtor serving Centennial, Colorado. She specializes in new built home sales. Don’t go shopping without her. She will save you money on your new built home purchase!